You are no doubt aware of the fact that LinkedIn is the most powerful tool to land your dream job and network with industry peers. What many professionals don’t realise is how powerful LinkedIn is when you apply some critical LinkedIn tips to boost your skills and endorsements. In addition to using LinkedIn for your personal profile, LinkedIn is also a powerful tool for businesses targeting the B to B industry. No matter if you are looking to boost your individual profile or that of your business, optimising your skills and endorsements is key to your success. To be the leader in your space, you have to implement every LinkedIn tip and trick you can get your hands on. 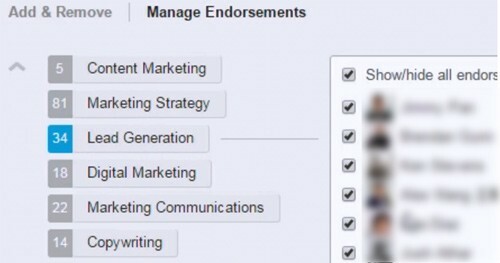 Most people don’t even realise you can reorder your LinkedIn skills and endorsements. Watch the video below to see these LinkedIn tips live in action. Reordering your skills and endorsements is particularly beneficial if you have changed jobs or industries. Updating these details is simple. Follow the three steps below to get started. 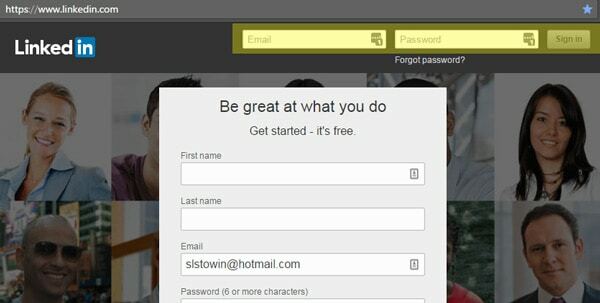 Log in to LinkedIn by putting your email and password in the top section. Register for an account if you haven’t already. Now we have located the skills and endorsements area; we need to update and improve them. So let’s run through the top 5 LinkedIn tips to boost your profile. First, you can have up to 50 skills listed, so definitely make use of this by putting in all 50 skills. Click on the Add Skill button by hovering your mouse in the area to the right of the heading. 2. Next, you want to make sure you have chosen the right options in the settings section. Unless you are going into hiding, it is recommended to tick yes and check all the boxes in this section. We are all here to maximise our profile as much as possible. 3. Now you can start typing in your preferred skills. In this example, I started with ‘sales’ and a few options I can be endorsed for came up. As you can see, both ‘sales funnel optimization’ and ‘sales funnels’ automatically populated. You need to select the ones LinkedIn offers. Sometimes you may type in a skill and select it only to notice you already have it. LinkedIn will tell you it is a duplicate skill. Choose another and hit add. The screenshot above says I can add two more skills. The one below says I can add 1. LinkedIn is counting down from 50. So if you have 40 skills listed, LinkedIn will say you can still add ten more skills. As mentioned above, make use of this and add 50 skills. The second tip that I have is that this section is very powerful for recruiters and potential employers to scan through. You must keep your skills up to date. Put a note on your calendar to review this section every three months. Make it a recurring calendar invite. You will notice this takes minutes and is well worth doing every couple of months. The third LinkedIn tip I have is you can reorder your list, so you’re top 10 showcase your best skills. This is important because you always want to have your top 10 skills showcased right at the top. Reordering your LinkedIn skills is simple. Within this section, you will notice it says “Drag to reorder.” Run with this and click and drag a skill to a new location. Any new skills you just added will be down the bottom. If it is now your top skill, then click and drag it up to the top 10. You can reorder this around as you see fit. Reordering your LinkedIn skills is the most likely task you will do every few months. In today’s fast-paced world, we are updating and changing our skills all the time. So make the time to update this section and focus on your top 10 skills. Tip number 4 is crucial to maximise your profile. Now you have updated your skills; many will have zero endorsements. It is time to reach out to your friends and colleagues and ask them to endorse you for your newly added skills. I’ve gone ahead and created an email you can use to send to your colleagues. Trust you are going well. I’ve just updated my skills on LinkedIn and was wondering if you could endorse a few of my new ones. I’ve just added (insert your new skills here) and would love it if you could endorse me for them. Keep your email simple. Just ask them to endorse you for your new skill(s) because some of your new skills may have zero endorsements. You can see in the image below I just added ‘sales funnel optimization’ so I have zero endorsements. Also, I pushed ‘content marketing‘ to the top, but it was not a skill I had in my profile until recently. As it only has five endorsements, it doesn’t look as sharp as say ‘marketing strategy‘ with 81 or ‘lead generation‘ with 34. Shoot out an email to your fellow colleagues and ask them to help you out. Now the fifth tip is that you can remove an individual who has endorsed you if you wanted to. To the right of the Add/Remove section you will notice a tab called ‘Manage Endorsements’. Click on that. From here, you click on one of your skills and the list of people who have endorsed you will come up. If you wanted to, you could remove one of the individuals in this list here by deselecting their name. They will no longer appear in your endorsed people for that skillset. This LinkedIn tip is a bit contentious, but some relationships end badly, so people want to remove all traces of the person from their life. Now the most important LinkedIn tip of all. HIT SAVE after every update you make. It is so annoying when you make a bunch of changes and forget to hit save. Nothing worse. I am a big believer in coincidence. You never know when the right person views your profile, offering you the life-changing opportunity you have been waiting for. Start now and optimise every aspect of your LinkedIn profile and see what coincidences come your way.